Schlüter®-BEKOTEC-F is a modular system for crack free and functionally safe floating screeds and heated screed with coverings made of ceramic tiles, natural stone or other materials. The system is based on the studded screed panel Schlüter®-BEKOTEC-EN 23 F, which is directly installed on top of load bearing substrates or conventional heat insulation and/or sound insulation panels. The geometry of the Schlüter®-BEKOTEC-EN 23 F studded panel results in a minimum screed thickness of 31 mm between the studs and 8 mm above the studs. The studs form a grid pattern with a distance of 75 mm between them to accept 14 mm diameter heating pipes if a heated screed is to be installed. The floor heating system is easily adjustable and ideally suited for use with low temperatures, since the screed volume to be heated or cooled is relatively small (28.5 l/m2 with 8 mm coverage). 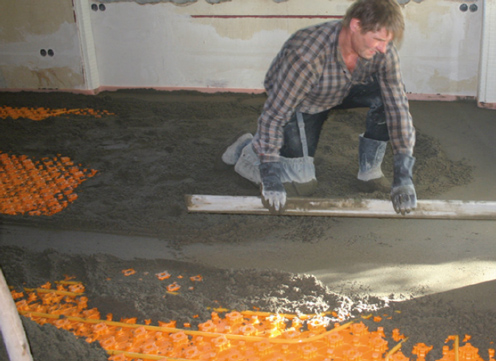 The curing stresses that occur in the screed due to shrinkage are absorbed by the studded pattern, thus controlling deformations such as curling. It is therefore unnecessary to install movement joints or control joints in the screed. As soon as the cement screed is ready to support weight, the uncoupling mat Schlüter®-DITRA can be installed (calcium sulfate screed < 2 CM-%). Ceramic tiles or natural stone tiles are then installed directly over this layer, using the thin-bed method. 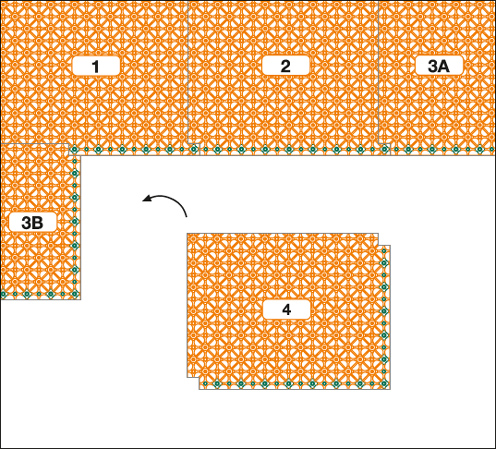 Movement joints in the covering layer are created using Schlüter®-DILEX according to industry guidelines.